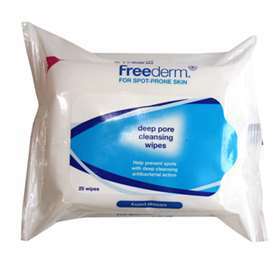 Freederm Deep Pore Cleansing Wipes are specially formulated to help prevent spots, keeping your skin clear and healthy. They help prevent spots by deeply cleansing your skin with anti-bacterial agents. Freederm Deep Pore Cleansing Wipes are specially formulated by experts to help keep spot-prone skin clear and healthy. Suitable for all skin types, each wipe contains antibacterial ingredients to fight the bacteria that causes spots whilst cleansing the pores to remove dirt and oil, leaving your skin feeling clean and fresh. Peel back the adhesive label to remove a wipe, unfold and gently wipe over the face and neck, avoiding the delicate area. For best results use morning and evening. Reseal pack after use. Dispose of used wipes in the bin (do not flush). Aqua, Alcohol Denat., Propylene Glycol, Laureth-23, Didecyldimonium Chloride, Phenoxyethanol, Panthenol, Parfum, Methylparaben, Benzalkonium Chloride, Propylparaben, 2-Bromo-2-Nitropropane-1,3-Diol, Simethicone, Sodium Citrate, Butylphenyl Methylpropional, Coumarin, Hydroxymethylpentyl, 3-Cyclohexencarboxaldehyde, Linalool.